Welcome to another Key-Word Cavalry day! For all my new bloggy friends (and those who missed it before), every Wednesday except the first of the month, I answer some writing/editing etc. related questions. I do this in two ways. I either go through the lists of key-phrases that brought hits to my blog, but that I don’t feel have been addressed enough by my posts, or I answer questions asked in the comments. So… today is the latter. Although people use the terms revisions and edits interchangeably, they’re not in fact the same thing. Revisions involve making big changes to a manuscript. Structurally: Adding or deleting chapters and all changes that need to happen as a result. Or in the story: Getting rid of or adding characters. Redoing important plot points that will require extensive changes to the rest of the work. Or other changes for example: changes in narrative like past tense to present tense, or first person to third person point of view. Editing involves smaller, more localized changes. Editing can be subdivided further, but I’m not going to go into that too deeply. 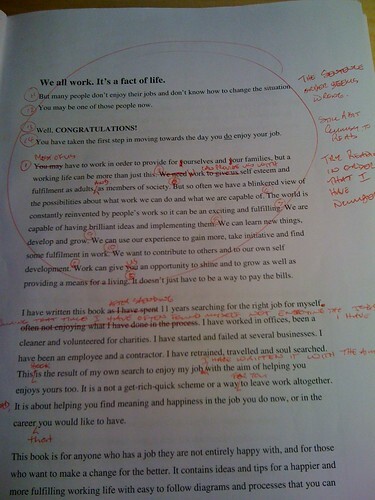 Examples of editing: replacing words with better ones, re-organizing paragraphs (although this can fall on the revision side of the line, depending on the amount of re-organizing you plan to do), fixing spelling and grammatical errors. So when I say start with the biggest changes, I am suggesting that you start with structure (revising), then changing things within the story (revisions), then changes in narrative (revisions). Once that’s done: I suggest that you go through changes to paragraphs (as edits), then improving writing flow (edits), then replacing words (edits) and finally spelling and grammatical errors (edits). The reason why I suggested this was simply as a way to save time. If you get stuck on small edits first and then discover that you need significant rewrites or deletions, you would have wasted lots of time fixing things that won’t even make it to the next draft. Of course, no one follows the above to the letter, but I don’t think I’ve ever met anyone who finished edits by mixing them with revision. So! Do you agree on my somewhat short explanation of revisions vs. edits? Do you have any questions that you’d like for me to answer for Key-Word Cavalry?